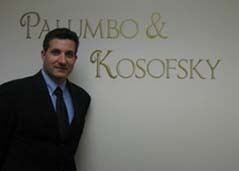 When Attack That Ticket founder Michael J. Palumbo was looking for a partner at Palumbo & Associates, PC to expand availability of skilled, affordable legal representation to the motoring public he only knew what qualities he did not need. Having a background as a police officer is a great asset, but Michael wanted to take the opportunity to bring more to Attack That Ticket. Mark adds that quality to the firm. Mark is a career trial attorney with over 20 years experience and dozens of jury verdicts under his belt. In addition Mark has done countless trials and hearings directly before a judge. The experience of trying cases before judges makes Mark a superior advocate when trying traffic tickets because there is no right to a jury trial in virtually all traffic matters. Unlike many attorneys Mark understands the difference in advocating before a jury or before a judge. From the very beginning Mark’s career has been dedicated to trial advocacy. While a student at Brooklyn Law School Mark searched the country seeking classic training in the art of trial advocacy. Mark spent a semester at Southwestern Law School to train under the renowned criminal law and trial advocacy Professor Norman Garland. Over the years Mark has continued his trial advocacy training by completing numerous trial advocacy courses and training seminars. In addition to his trial duties, Mark heads the Moving Violations Defense Unit. Mark carefully reviews the circumstances of the stop and the ticket in order to give each of our clients the best possible defense. Mark primarily covers Nassau County, Queens Criminal Court, and the justice courts of Suffolk County. Mark’s litigation experience and skills are a valuable asset in instances where multiple tickets were issued, when the motorist has a bad recent driving record, and in those cases where defense of the ticket is otherwise particularly difficult. The next time you get a traffic ticket get Mark Kosofsky and Attack That Ticket on your side. Call us today for a free phone consultation.